Meher and Matt’s dream was to combine Indian and Jewish traditions at their Tuscan style hotel wedding in Spain. With guests travelling from as far as America and India it was guaranteed to be a colourful affair. The couple, who originally met at Harvard, had already enjoyed an Indian wedding in Bombay. The second part of their celebrations they decided to hold somewhere between Matt’s homeland – the U.S – and Meher’s – India – to make it easier for guests to access the fun. 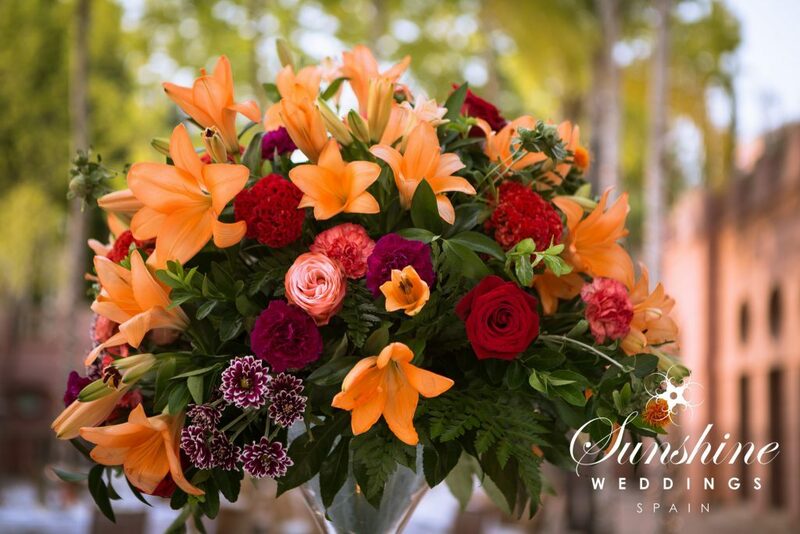 After contacting Sunshine Weddings Spain they felt that Spain would be the perfect place for their destination wedding. After viewing a selection of venues the couple felt torn between a luxury hotel which enjoyed a privileged beachfront location in the middle of Marbella’s famous Golden Mile and a hotel which was constructed to replicate a Tuscan palace in the hills above Marbella. In the end they decided to go with a little of both. The pre-party was held at the beach hotel in the freshly renovated restaurant situated on the shore of the Mediterranean. It is one of the most beautiful beach clubs on the Coast, offering guests tranquillity and sophistication. The wedding was to be held at the Tuscan palace hotel. Surrounded by rolling lush green fairways and sweeping views over the sparkling blue Mediterranean, it is a memorable sight. The grand, antique filled interiors lend the hotel an air of aristocratic elegance, which makes it the perfect setting for a special event. With so many beautiful options within the grounds for the ceremony, it was the open-air amphitheatre which was the deciding factor for Meher and Matt when they selected this hotel as their wedding venue. Next week we find out in Part Two whether Sunshine Weddings Spain were able to make all Meher’s and Matt’s dreams come true.